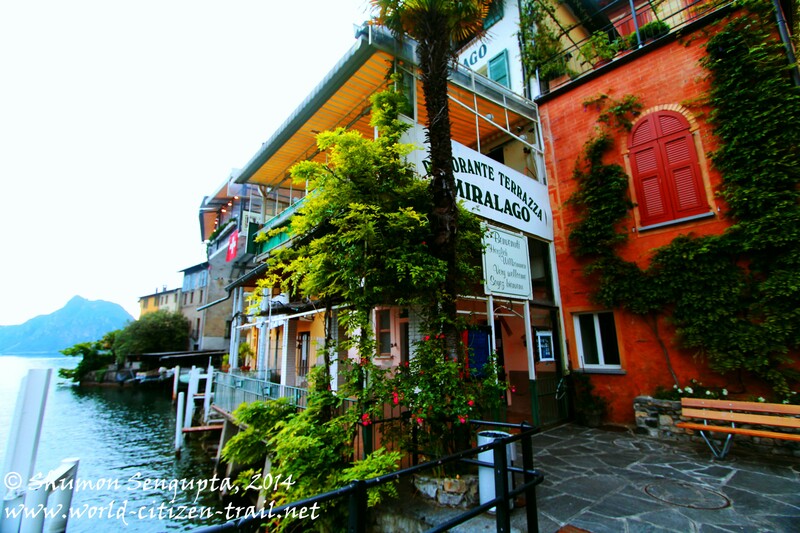 In this post, I shall describe our trip to Gandira (a former fishing village) by Lake Lugano, about 5 km from the city of Lugano. 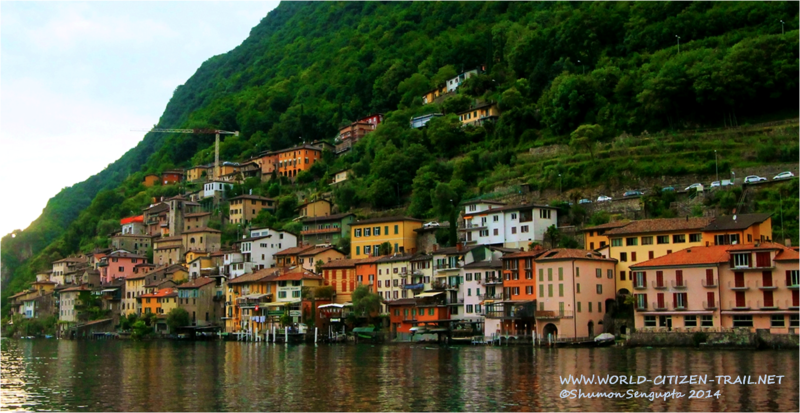 Nested and sheltered between steep Alpine slopes, Lake Lugano straddles both Switzerland and Italy, the larger part of it lying in Swiss territory. Apart from a breathtaking combination of shimmering deep blue waters and mountainscape, the long winding shore is dotted with charming, quaint little village and hamlets. The lake is tailor made for leisurely boat rides and hikes along its shores. 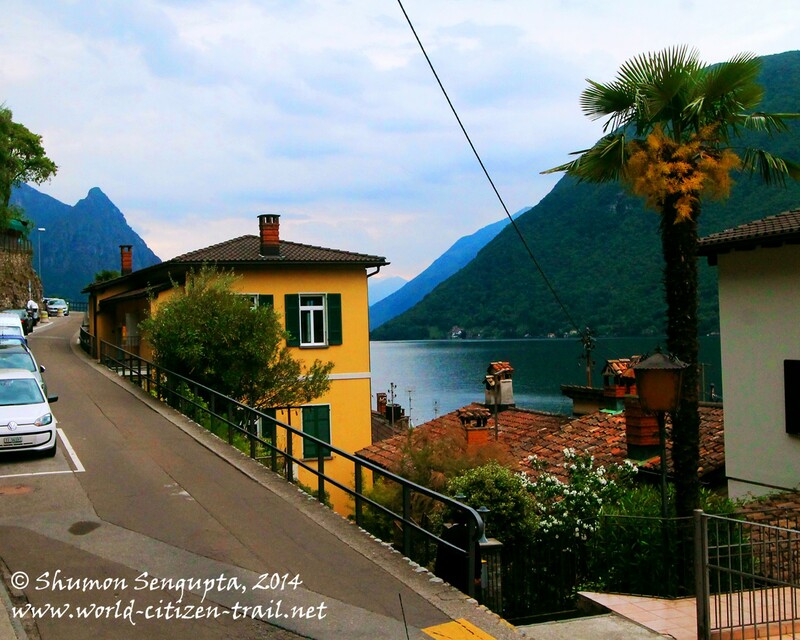 In Lugano, we took the bus for Cassarate and from there headed for Gandria by boat – a ferry which takes a circular route. Halting briefly at a few villages by the lake shore, it took us about 25 minutes to reach the village. The gentle cruise over the tranquil crystal clear lake provided us splendid views of the wooded mountainsides and desolate villages and hamlets, with lake side footpaths and trails along the shore line. During the cruise, which is a round trip, you have the option of getting off in any of the stops, exploring the place and then getting on to the next boat. In case you are on a Swiss Rail Pass, which we were, the boat ride is included. 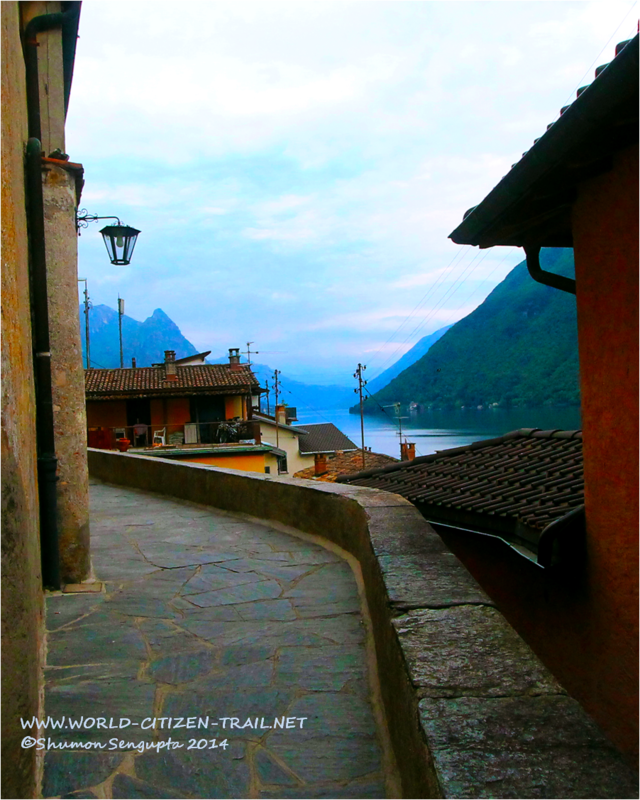 Approaching Gandria, we could see the scenic, colorful little village at a distance with a dense cluster of charming old houses, almost hanging off the mountain side, on to the lake. 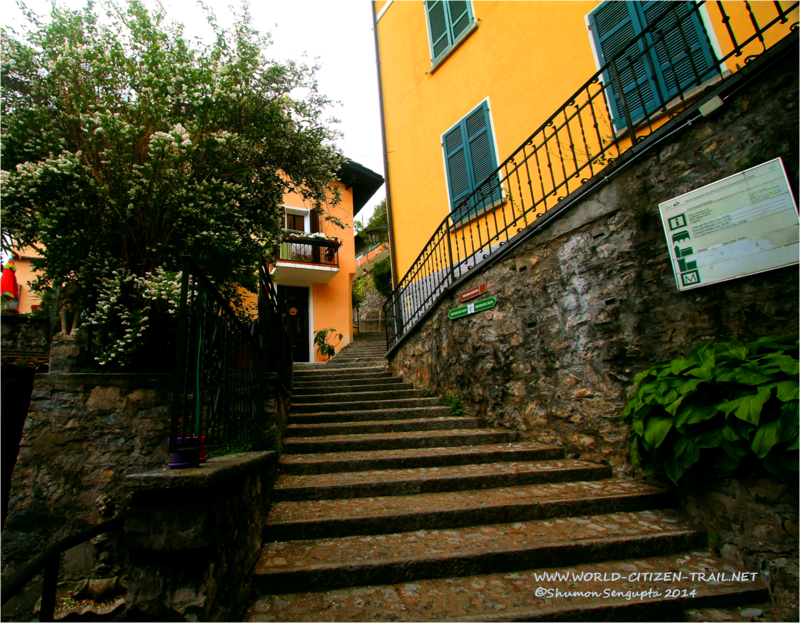 The village was perched along the steep incline of Mount Brè, at the edge of Lake Lugano. 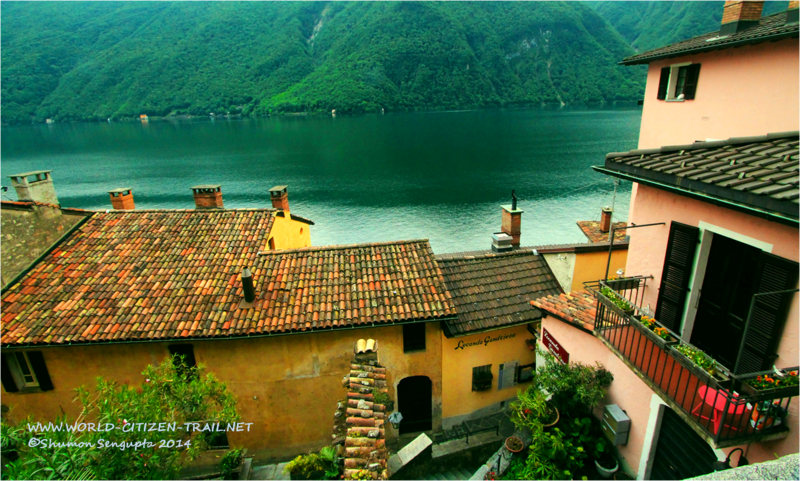 It looked as if the village had emerged out of the lake and snuggled on to the steep wooded hill side. The buildings were painted in white / cream and in warm shades of peach, burnt pink, red, chrome yellow and terracotta, presenting a splendid contrast to the aquamarine blue waters, the azure blue sky and the lush green mountains. Along the edge of the water there was a row of small boats docked. Large private houses had their own private little moorings. 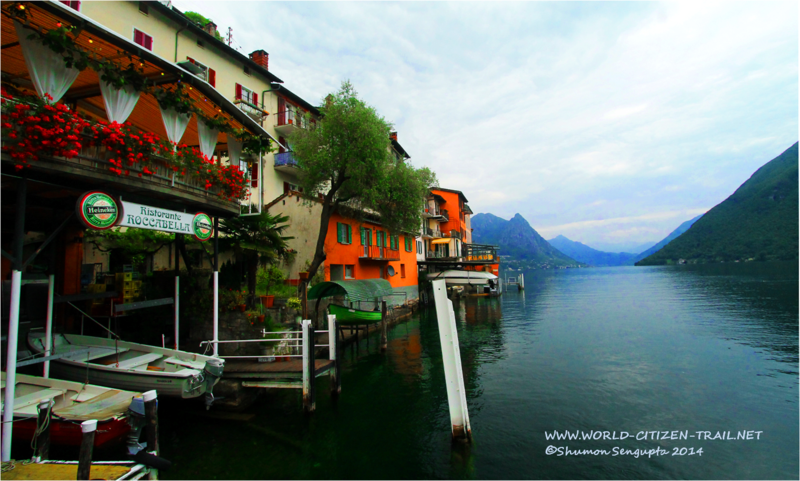 We got off from our boat at the dock – a small landing stage above the water. We were the only three to get off and not another soul was in sight – the place seemed totally deserted and silent. 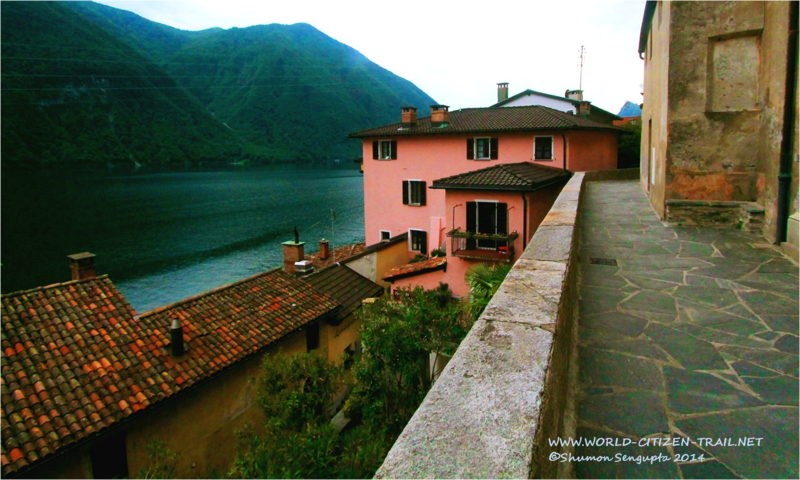 To our back was the vast expanse of the magnificent lake fringed by the mountains and to our front was a steep rise of very closely spaced, colorful small houses with balconies from which spring flowers hung in profusion – picturesque old buildings, perched on steep and narrow terraces. 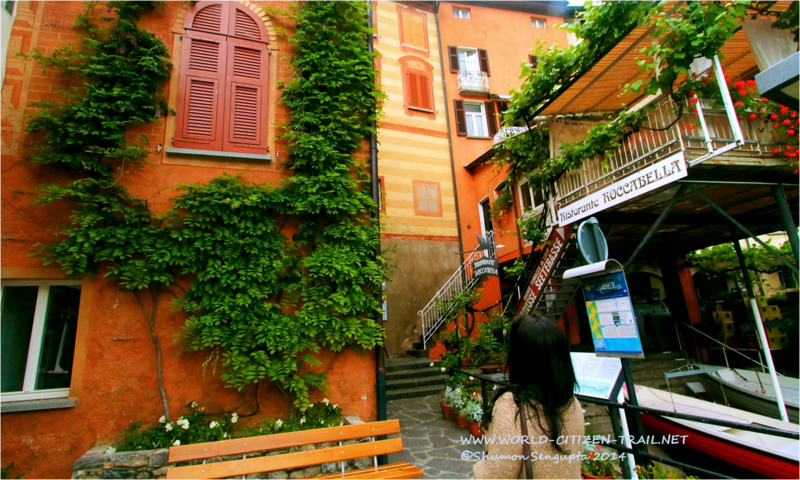 The houses were built predominantly in the Italian style. Next to the landing, to our right, we found an olive tree. With a height of about 10 meters and a diameter of 45 cm, it is supposed to be one of the oldest and thereby one of the most valuable and protected trees of Gandria. 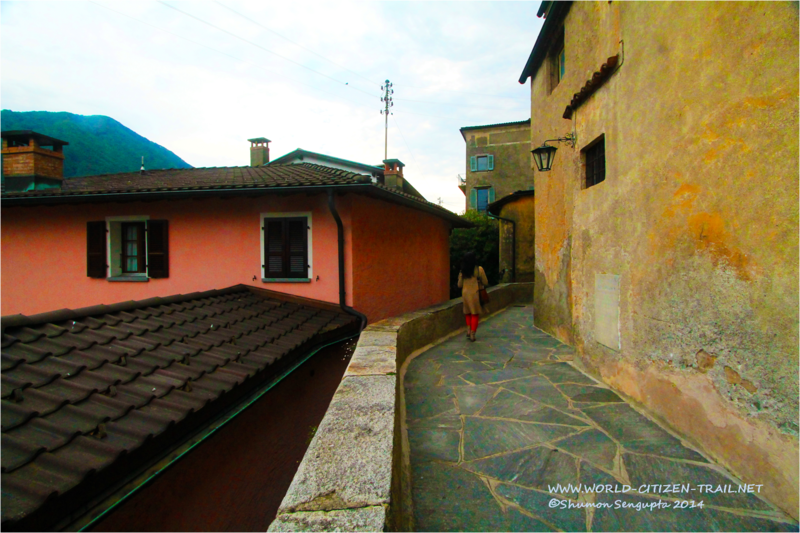 Gandria is not very far from the Switzerland – Italy border; it almost felt like we were in Italy. 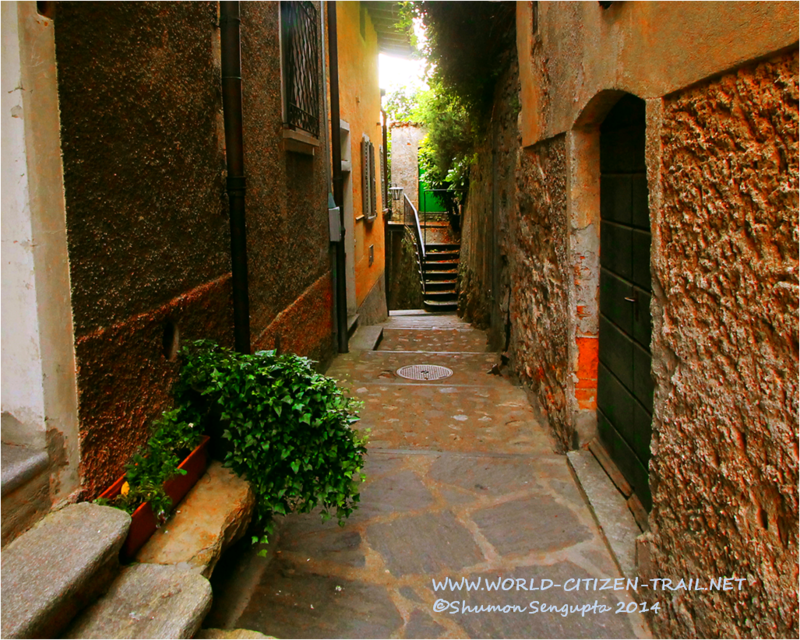 This village, I am told hasn’t changed noticeably in the last 100 years. 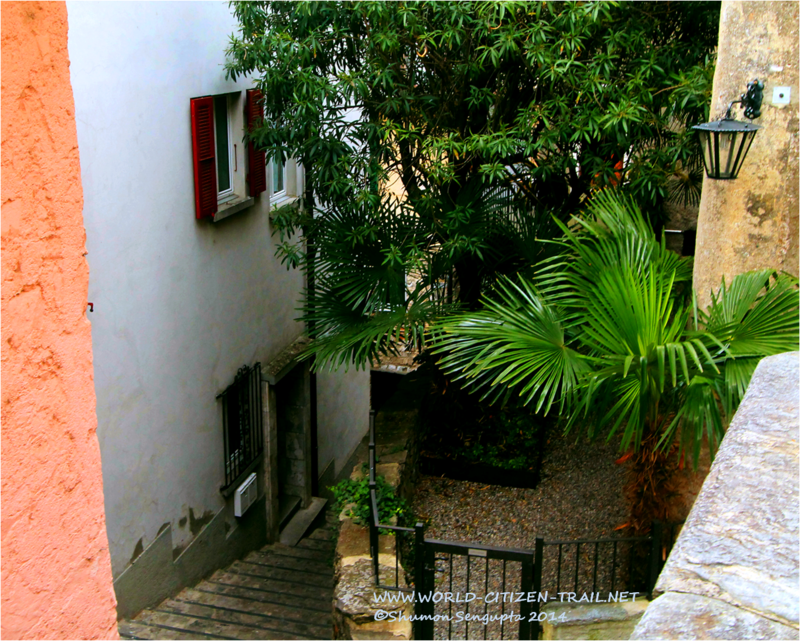 From the landing, we climbed up the flight of step steps towards the left and then turned left again, into a long alley. 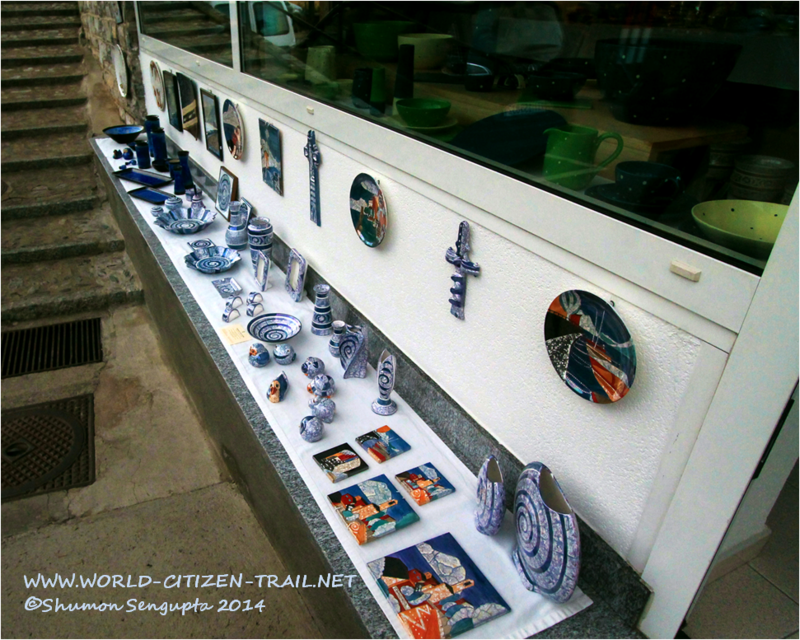 Although there were numerous restaurants, souvenir and crafts shops, the place had managed to hold on to its authentic old world charm – the feel of an old fishing village still hung in the air. 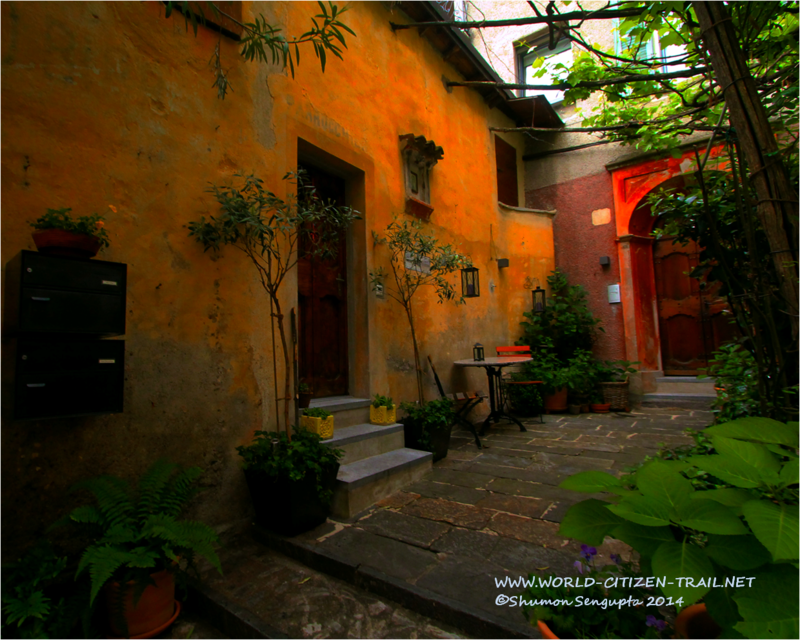 We found wonderful surprise and beautiful views around every nook and corner. 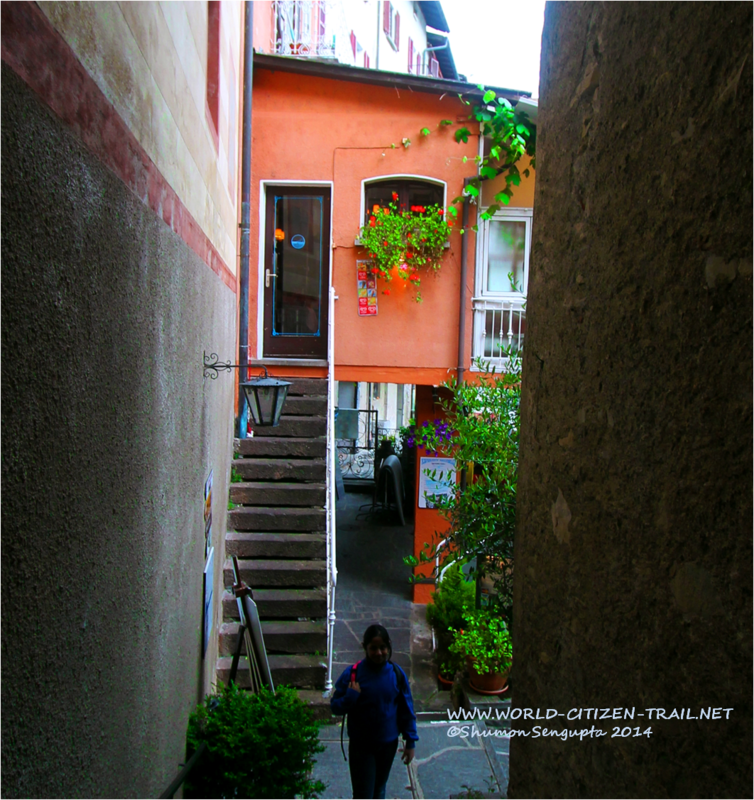 With barely 200 inhabitants, Gandria is considered one of the best preserved erstwhile fishing villages in Switzerland. Free of traffic, the center of the village is a protected heritage site. 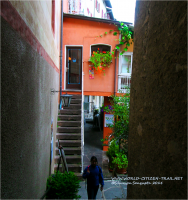 The village center, because of its very narrow streets, lanes, gradients and stairs, cannot be accessed with motorized vehicles, not even two wheelers; the only way to get around in the village is to walk. And walk we did. Whilst a road now reaches the outskirts of the village, most residents and visitors arrive at the village from the lake by boat. A luggage elevator is available to take heavy and bulky items to the upper reaches. 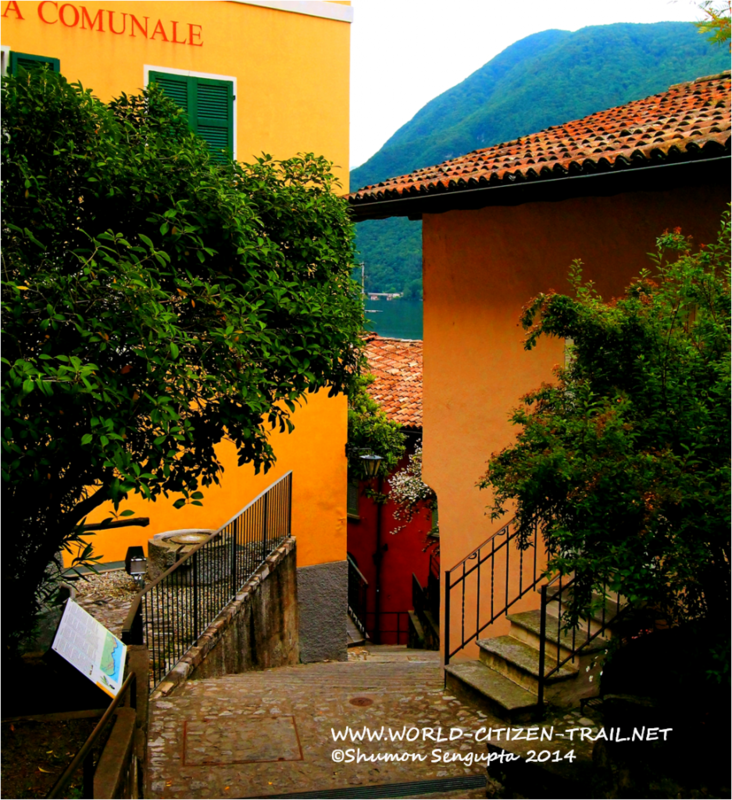 There is also a great hiking trail (the Olive Trail) between Lugano and the village, which I have covered in another post. You might want to check that out. 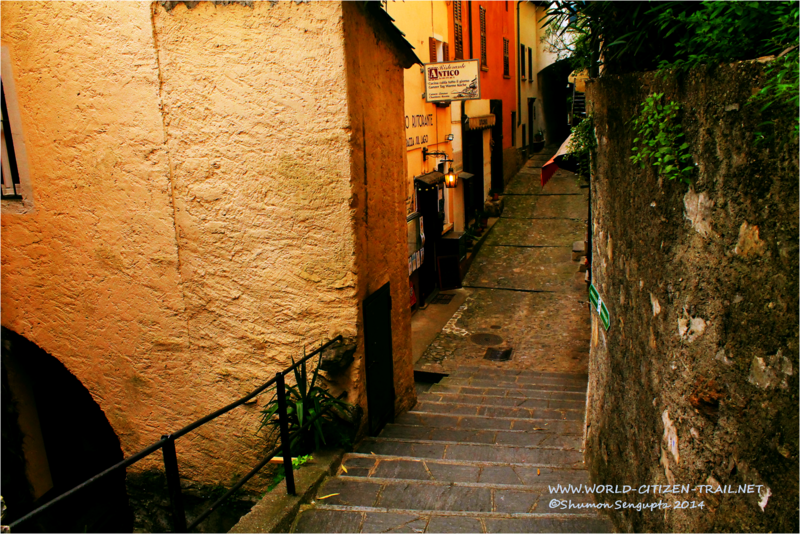 We discovered that the village was organized around steep narrow cobbled alleys, angular lanes, arcaded passages, grottos, ramps and stairwells. 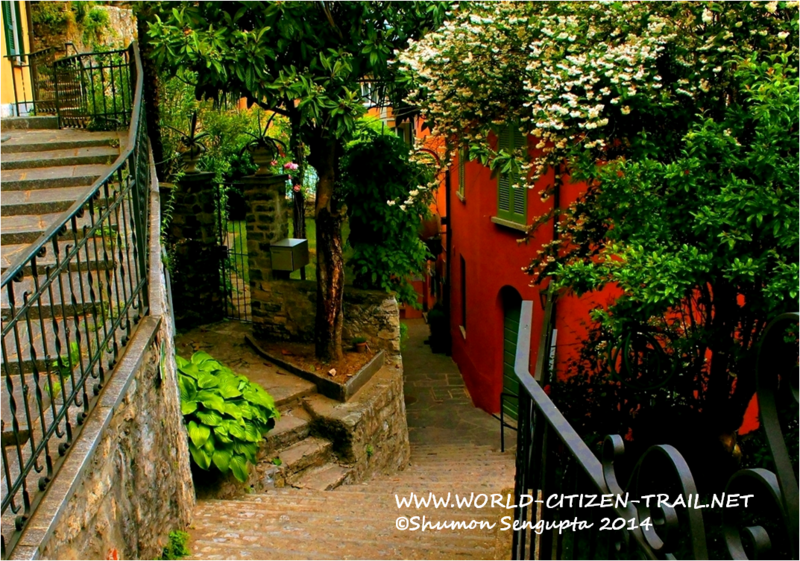 We found that it was an easy and ideal place to lose our bearings and wander about aimlessly. 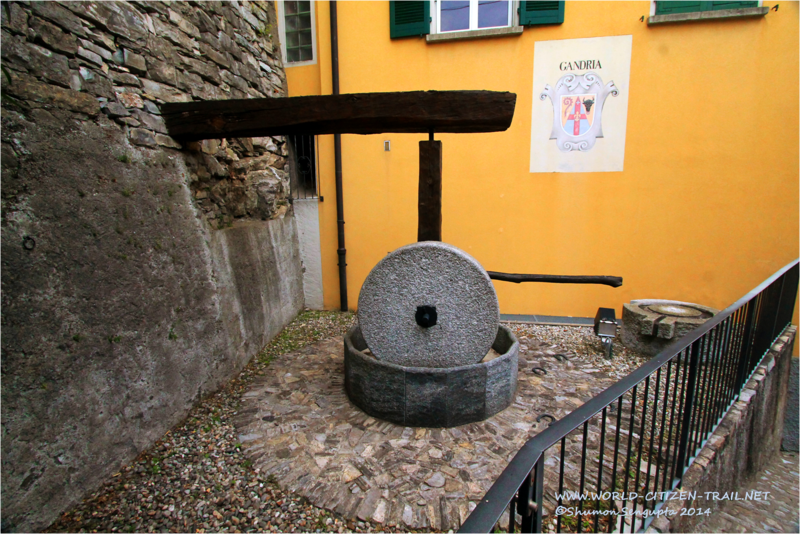 After exploring the lower reaches of the village, we climbed further up past the massive old olive press made of granite and arrived at the Piazza (or Plaza). From above, we got a beautiful view of the closely aligned, tight clusters of houses, realizing how steep the gradient of the village actually was and how old and charming the buildings and the labyrinthine layout was. 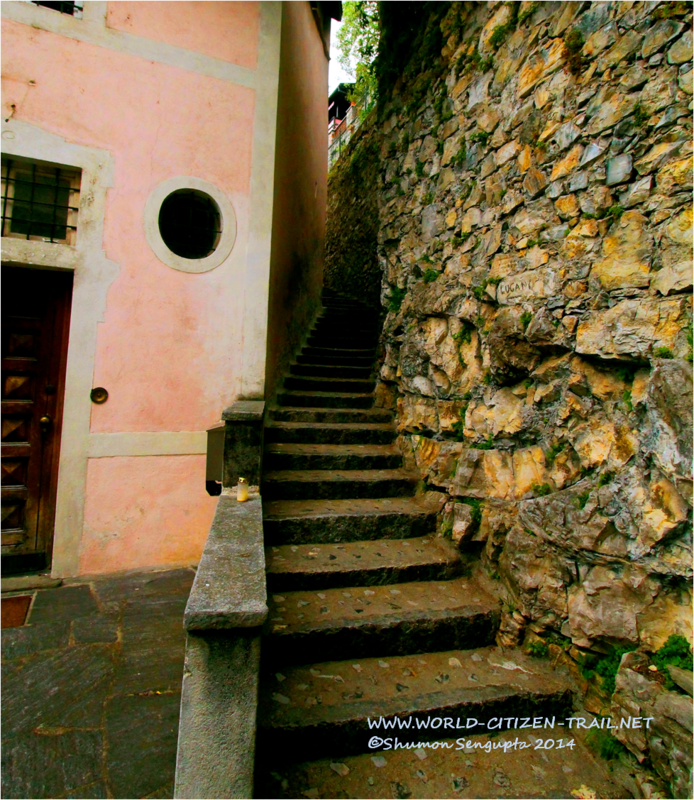 The houses, most of which could only be reached either through a steep passage / alleyways or through a flight of steep stairs, were arranged in cascades, right up to the water front. 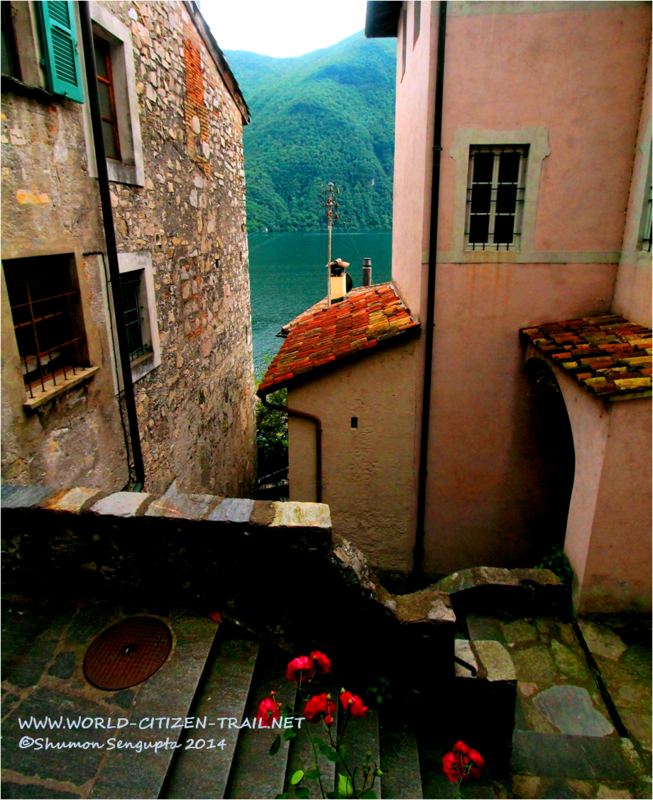 The view of the village from above was as splendid as it was from the waterfront. 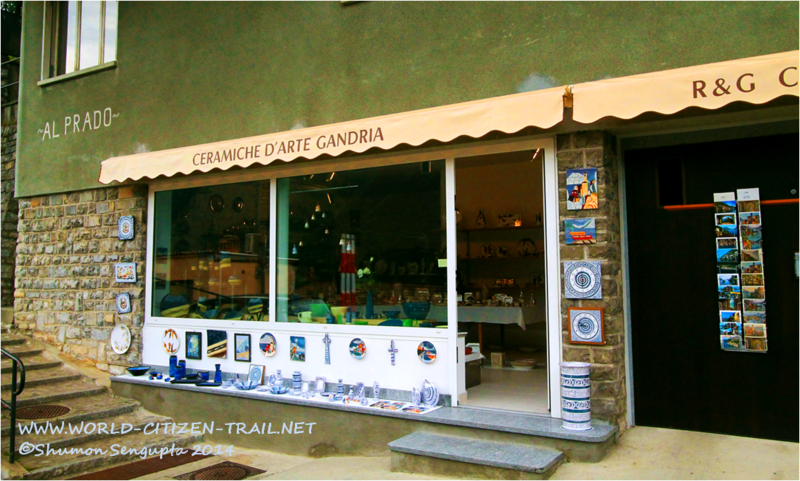 And at the plaza, we stopped briefly at the Ceramiche d’Arte Gandria, the family run handmade ceramic shop and picked up a beautiful hand painted ceramic plaque, depicting the waterfront of the village. 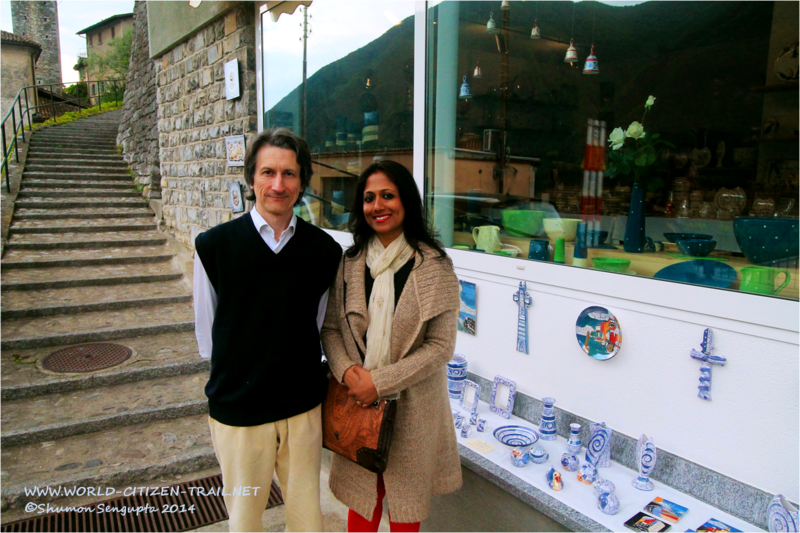 We also had the pleasure of meeting the ceramic artist and co-founder of the enterprise, Gian Luigi Costa and understanding more about his work. Gandria village has had a long artistic tradition and has been home to artists and architects of eminence over the centuries. 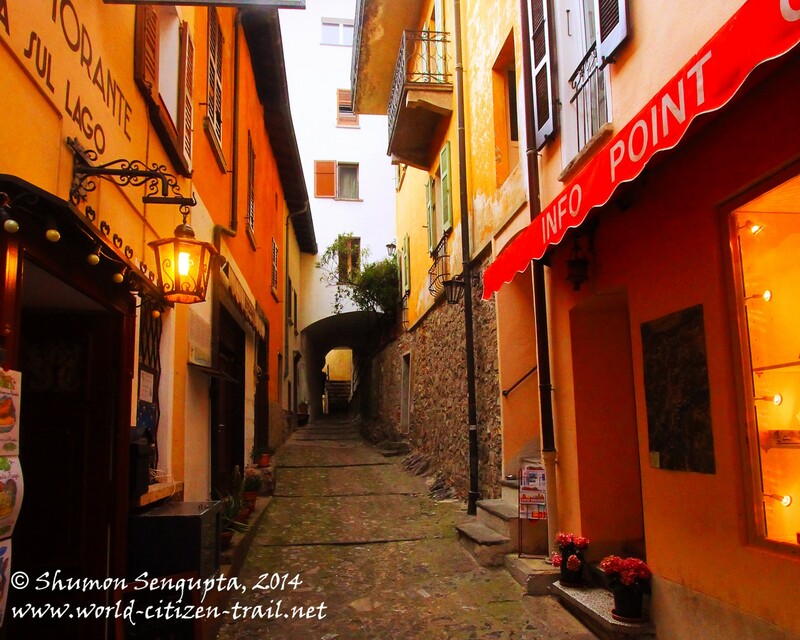 Famous 18th century artists, the Torricelli brothers Giovanni and Giuseppe were from this village. 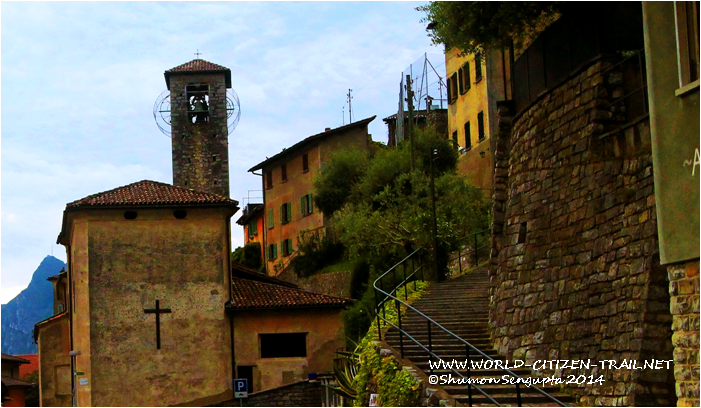 At the center of the village, we found the San Virgilio church (or Chiesa di San Vigilio) with its tall and prominent bell tower, dating back to 1463. It has been renovated and altered in the subsequent centuries. The interiors, I am told, are elaborate and ornate, in the Baroque style. When we went, sadly, the church was not open. 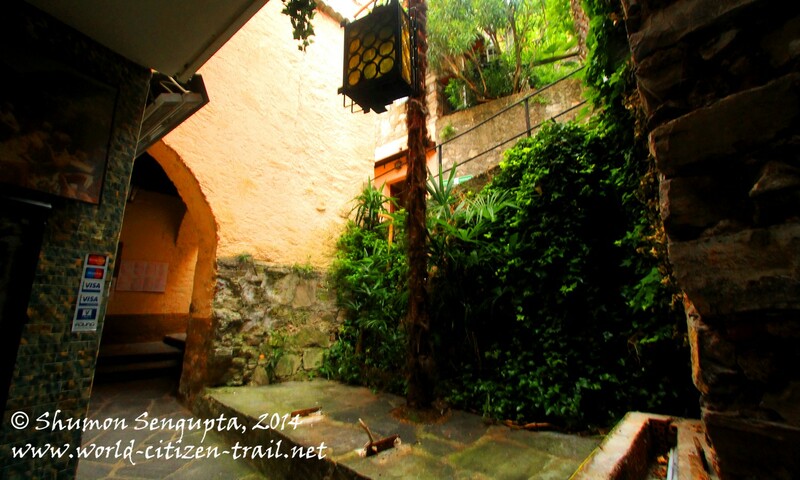 From the plaza, where we spent some time, we followed the green olive signs, climbing up a steep curved lane and then through a long, narrow flight of stairs, on to a graveled path that eventually led us into the olive trail. 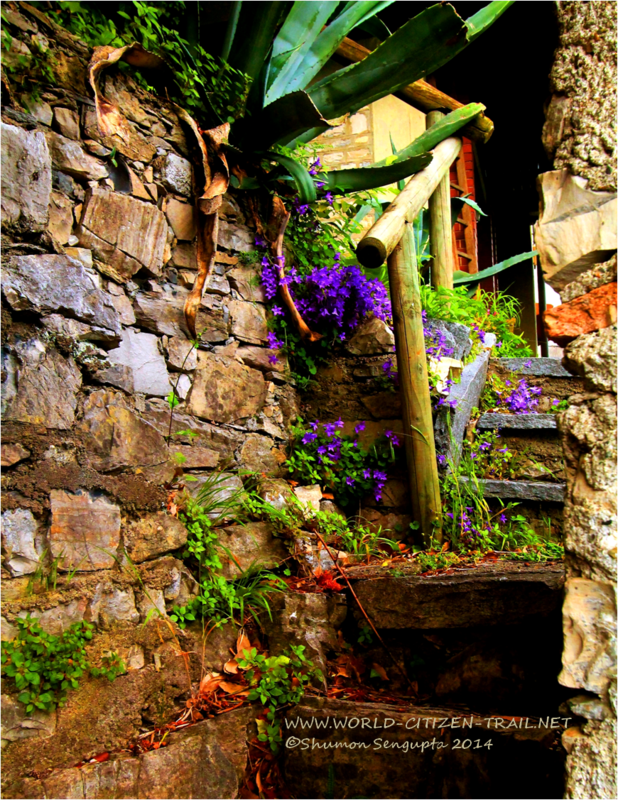 We passed through houses, whose walls had drapes of climbers and flowering shrubs, rooted in the crevices in the stones that made up the walls. 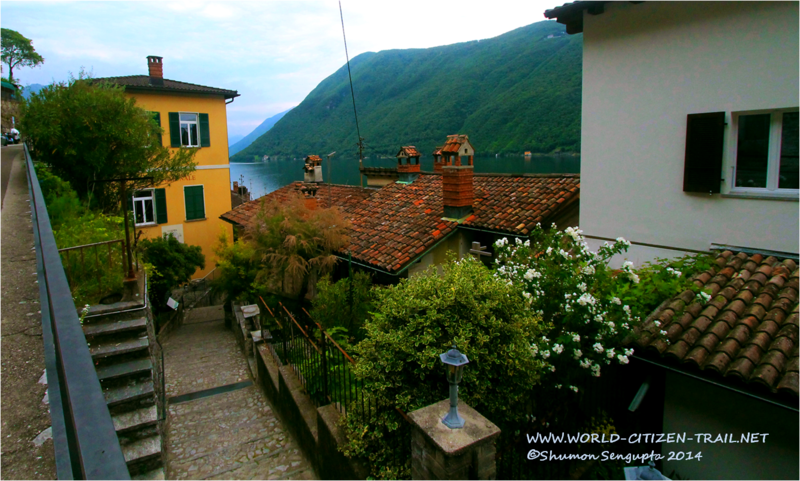 All along, we caught some stunning vistas of the village, with Lake Lugano peeping in at different places. 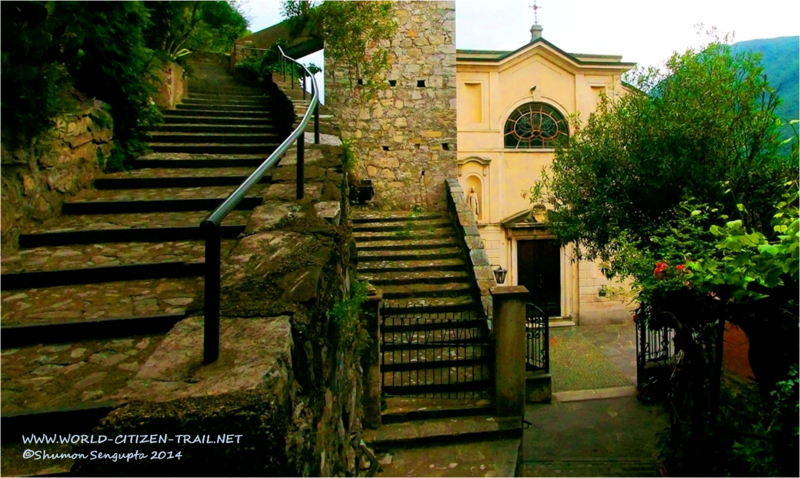 The Saint Vigilio church was constructed in 1463. 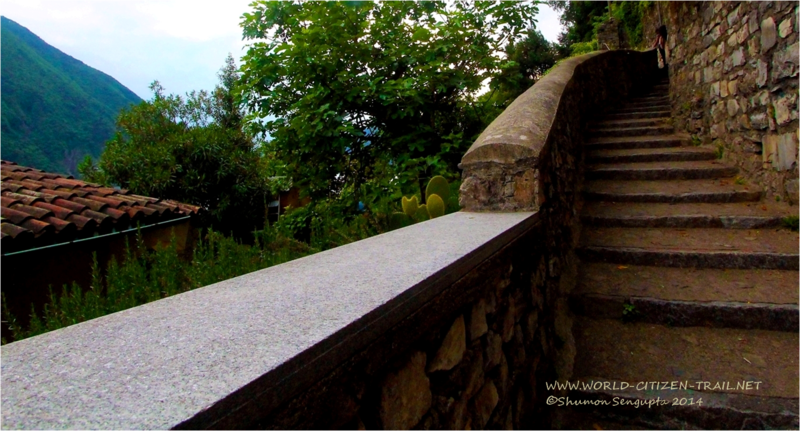 The oldest section of the church is the brown- gray wall facing the lake as you walk upward. 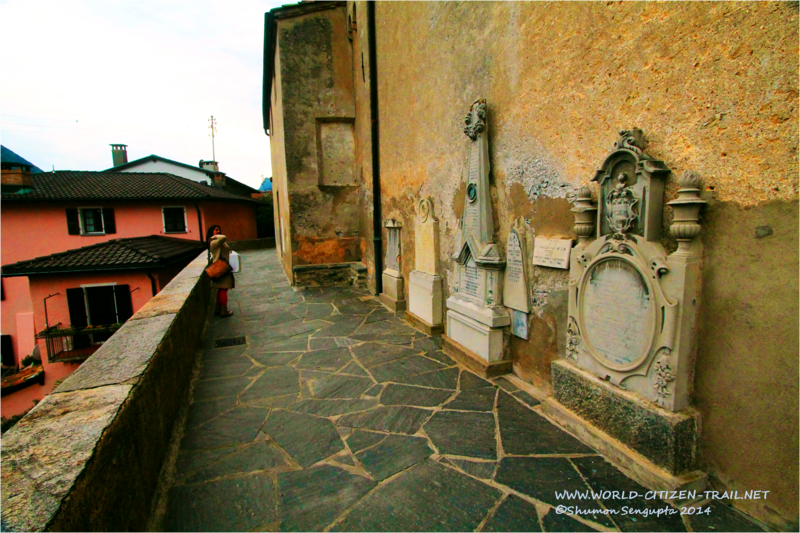 On this wall, as seen in the photograph above, you find memorials (in stucco and stone) dedicated to very old and well-known local families of Gandria. As mentioned earlier, the façade of the St. Virgilio church was redone in Baroque in 1870s. Inside the church, behind the altar is a large oil painting by the brothers Giovanni and Giuseppe Torricelli. The painting depicts the martyrdom of Saint Vigilio, a bishop of Trento (in Italy), who is said to have been stoned to death by pagan shepherds. 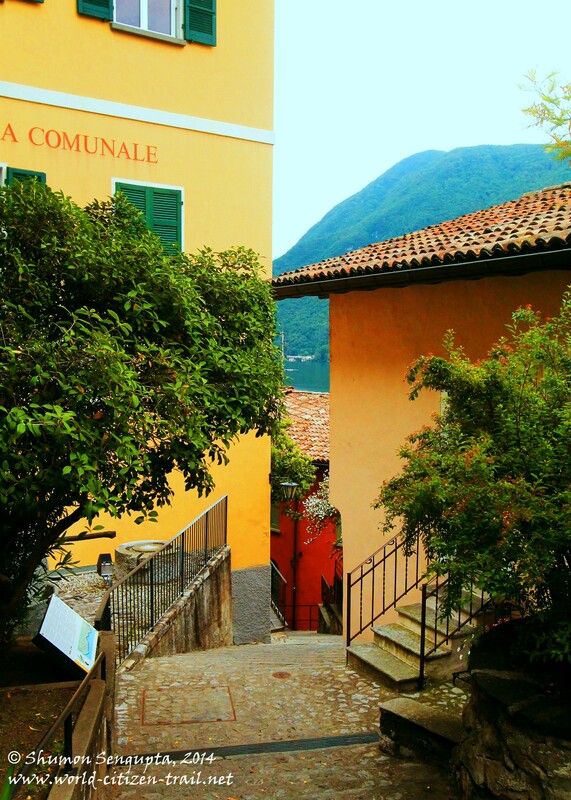 Now considered a prosperous, up-market place, Gandria was even a century ago, a very modest, humble isolated little village in which main occupations were fisheries, farming and minor trading. Change in fortune, we realized however had not changed the essential character of the village in which a quaint old world charm and spirit still lingered in the air. Many inhabitants of the village I learnt are from old families that go back for many generations. 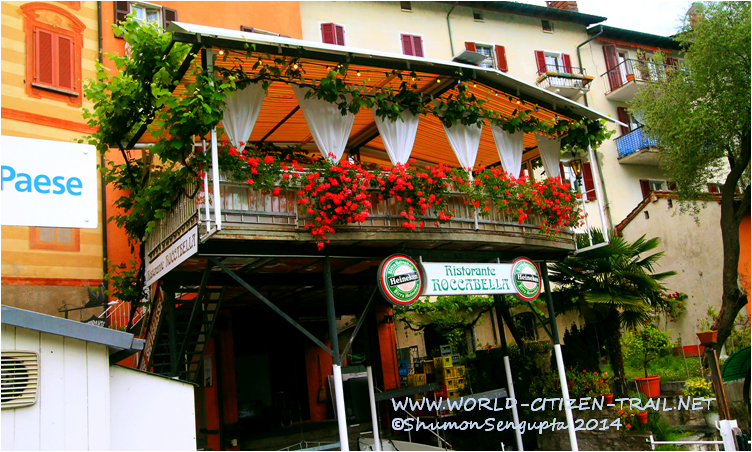 The rest are from other cantons of Switzerland, as well as settlers from Germany, Italy, Palestine, United States etc. 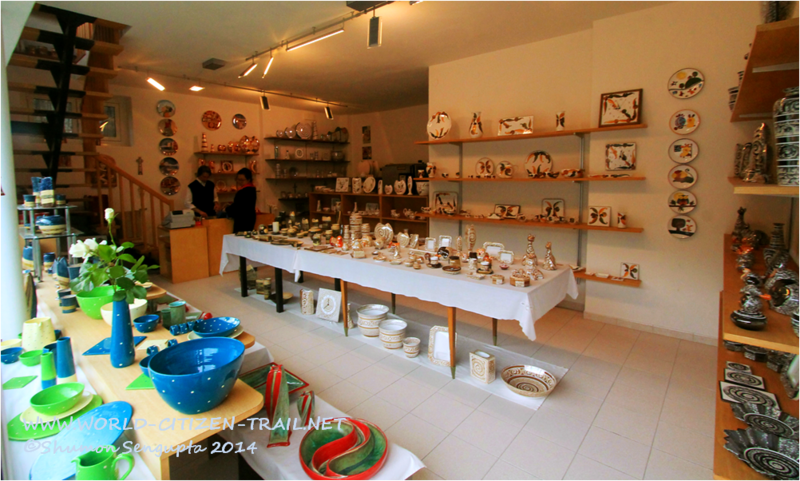 People no longer engage in fishing as an economic activity, they are into other professions and the village does have its fair share of architects and artists, the latter being musicians, painters and ceramic artists. 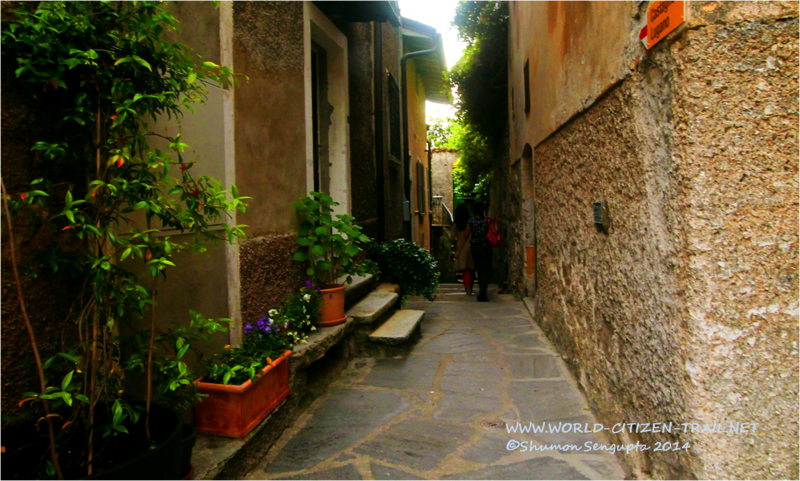 In Gandria, it felt like we had stepped into a beautiful picture postcard and travelled back in time. 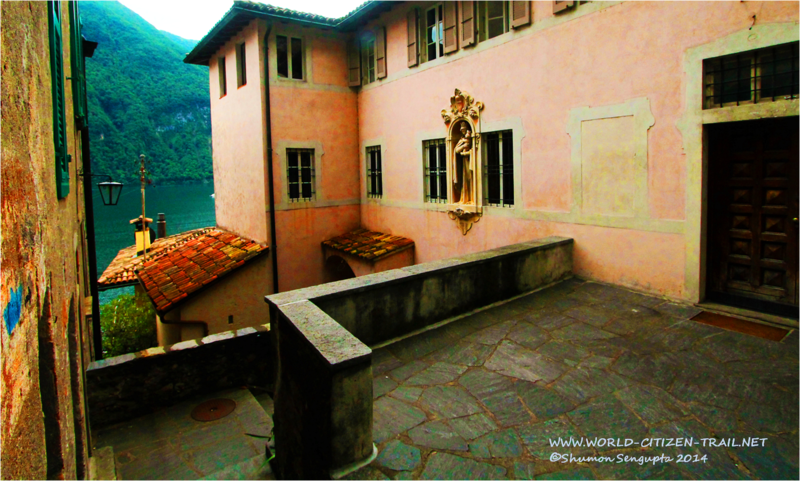 “Gandria is a corner of the world, untouched by noise, located in sweet solitude on the steep mountainside, overlooking the deep lake in which it is reflected. The wave of human misery does not beat upon its shore, the spirit can move freely in ideal skies and the soul finds itself in the ecstasy of contemplation”. A hundred years down, we felt the same in Gandria. The voice of Giorgio Simona echoes true even today .. 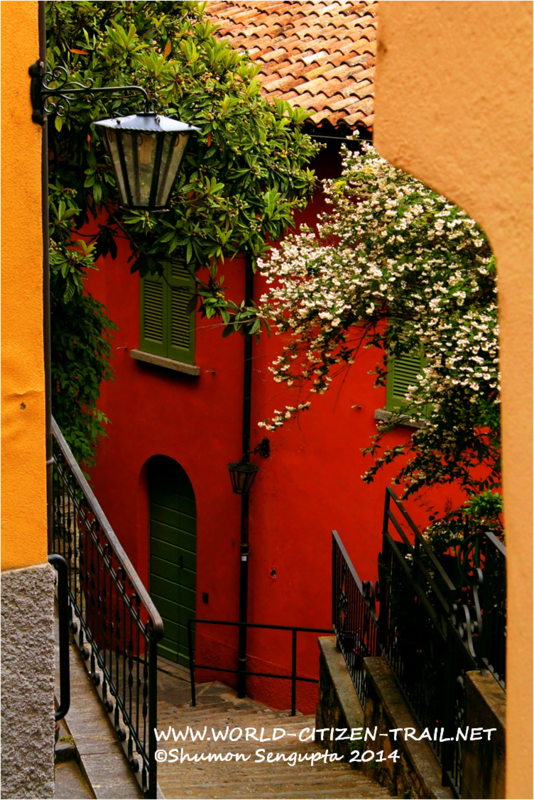 There are frequent buses (Monday to Saturday) from Lugano to Gandria throughout the day, leaving Lugano in front of the Railway Station and taking you to Castagnola Posta (Post Office) in about 15 minutes. 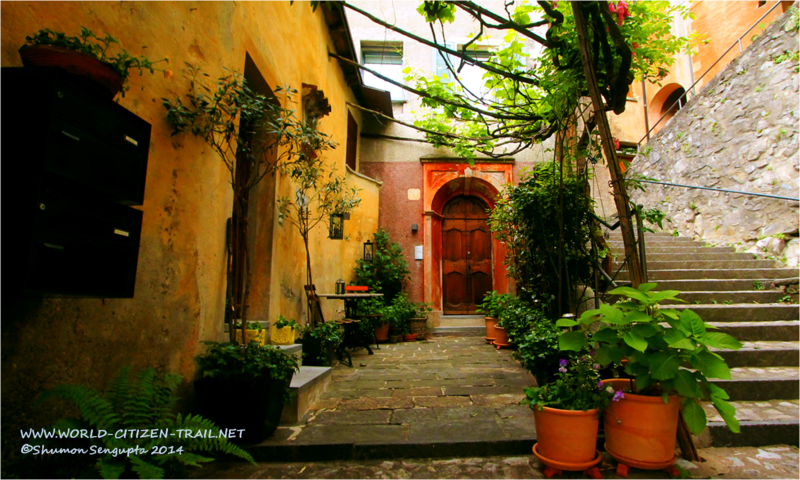 From Castagnola Posta, it is a 30-45 minute walk (about 2 km), depending on your pace, to Gandria. The most convenient way to reach Gandria from Lugano is by the Ferry, which again has regular service throughout the day. 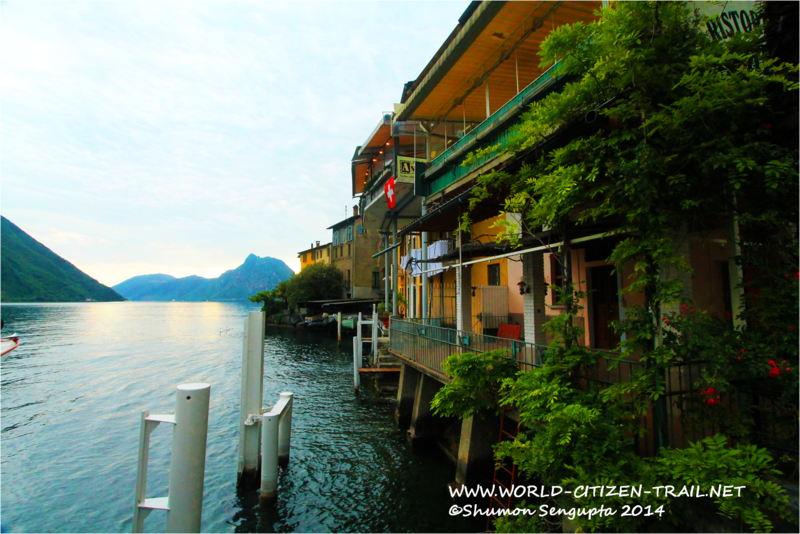 You can take the Ferry either from Lungao Station, or Paradiso or Cassarate, depending on which part of Lugano you are in. 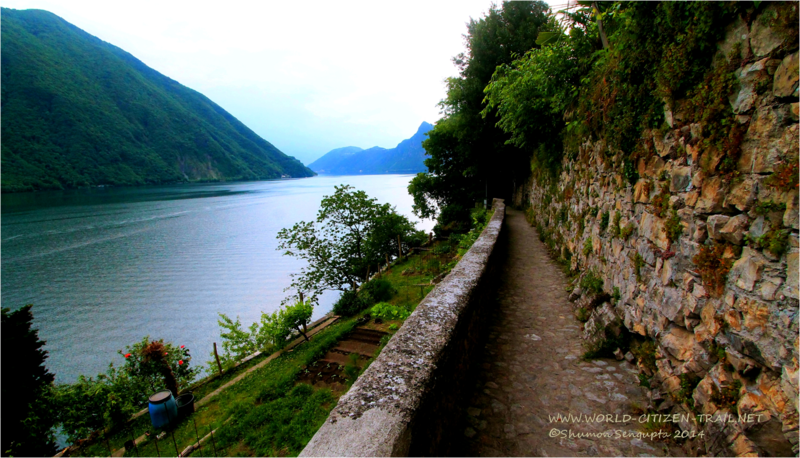 From Gandria to Lugano, the boat ride is 30 minutes. Check out the timetables. If you are returning from Gandria by boat, check out the time of the last boat out of Gandria. It changes between summer and winter. 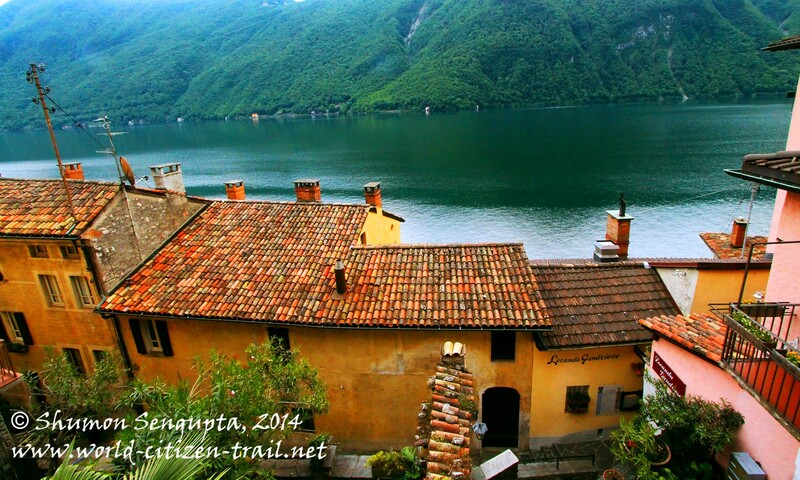 From Gandria, the best option is to take the clearly marked lakeside hike along the Olive Trail. From Gandria, you will reach Castagnola Posta in 30-45 minutes depending on your pace. We however took a full hour because we did it very leisurely. 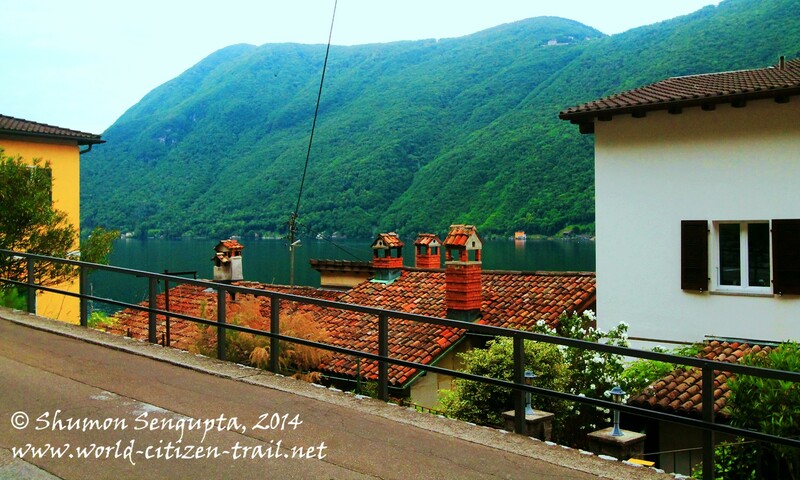 From Castagnola Posta, you can take the bus back to Lugano. 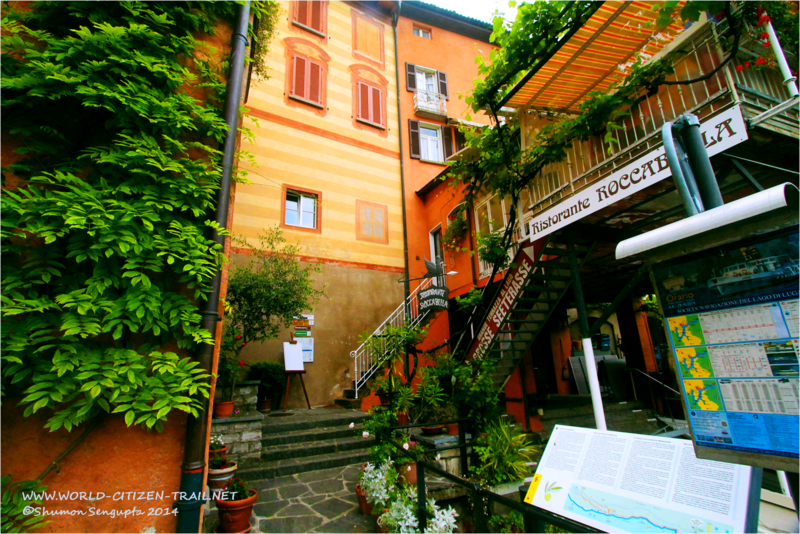 If you have time, plan to spend a full day for the Gandria trip. 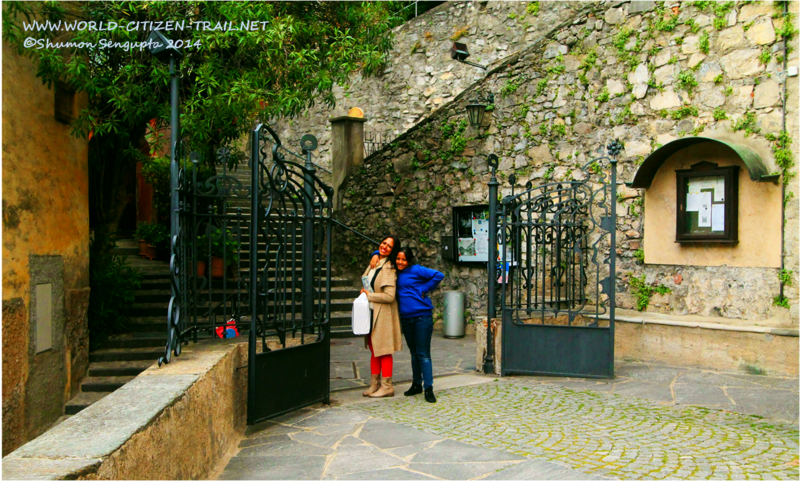 Reach Gandria by boat, spend the full morning there, have a relaxed lunch in one of the romantic (and expensive) restaurants and then take the leisurely hike back along the Olive Trail to Lugano. 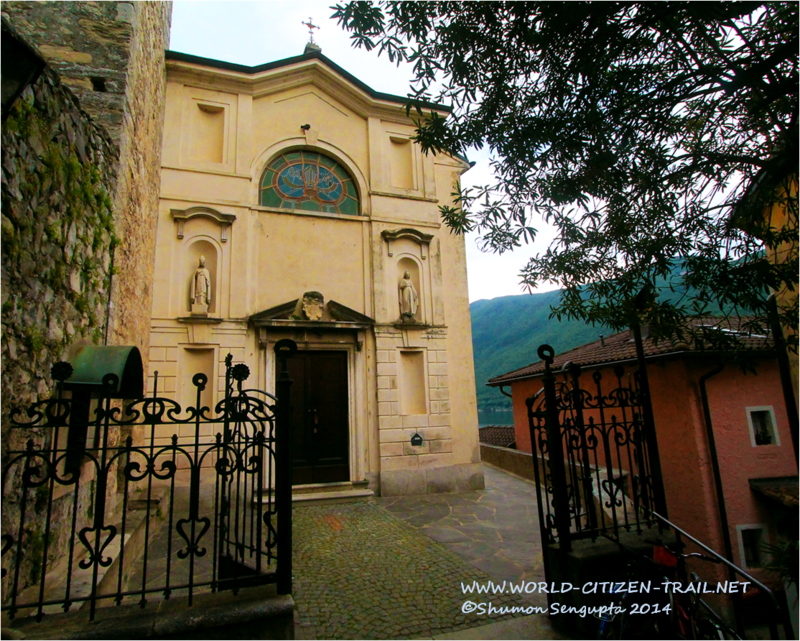 And don’t forget to visit the St. Virgilio church, if it is open. 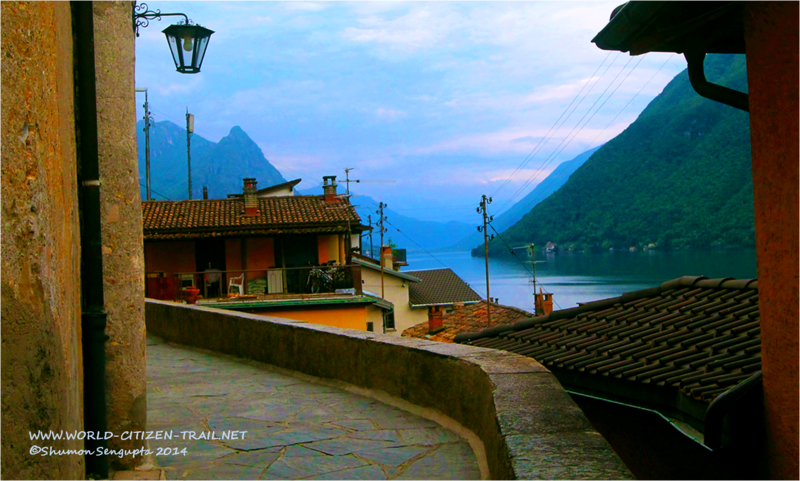 Alternately, you can carry a small picnic hamper from Lugano and have it in Gandria. That will be much cheaper and will also save you some time. 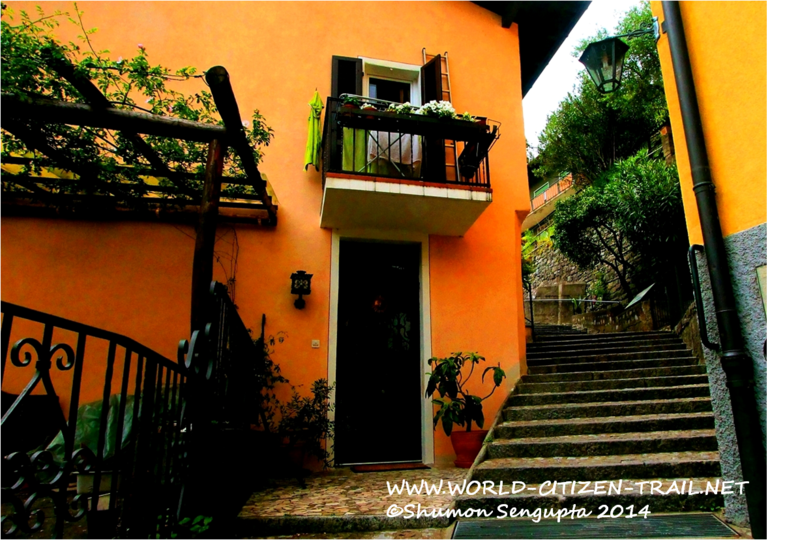 If you don’t have time, it can you can do the trip (including the Olive Trail hike) in half a day as well.